I love this beautiful rug and the color is true to the picture. It is thinner than I thought it would be, so I will be ordering a rug pad. This 100-percent polypropylene, machine-made rug comes in an elegant abstract design and stunning contrasting shades. 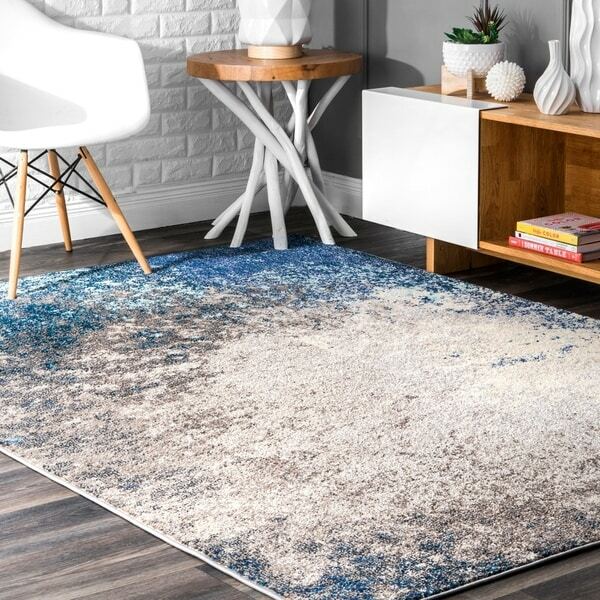 Perfect for a contemporary room decor, this rug has a low pile and will make a bold statement in any room. Love the vibrant colors, including a hint of teal. The main part of the rug is more tan/ creamy vs white/ grey. 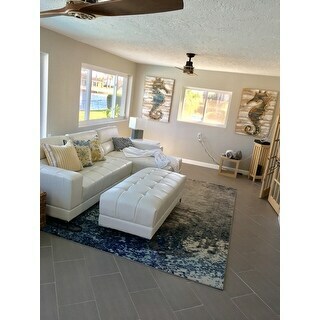 I have a beach theme going in my home and the 9x12 rug reminds me of watercolor/waves. I read EVERY review for about two dozen rugs. It was down to this and a Safaveiah rug that was very similar. I chose this one because the colors "graduated" from one corner to the other. The contender seemed like a softer mix of colors, but in some of the review photos, the rug looked blotchy and confusing. This one looks like a wave crashing on the sand. It's low pile -- my Shark Robot has no problem with it. I have a nice pad underneath. Get one. It makes the carpet go from cheap to luxurious. There's not a lot of white in it. I worried about my white sectional blending. It does. 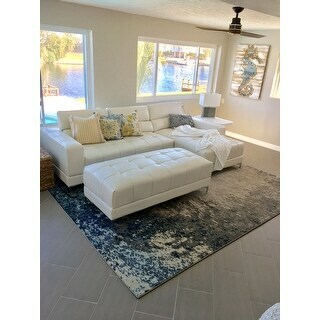 Compare this rug with a search from highest price to low. You'll see very expensive rugs that this one mimics nicely. I won't tell!! Option: Multi - 5' 3" x 7' 7"
I love this rug. The pile is a perfect height and the size fit my office just perfectly. The colors are bright and bring character into any space. I use it in my office and roll my chair on it with no wear after 6 months. I think the price was a deal for a rug of this quality. 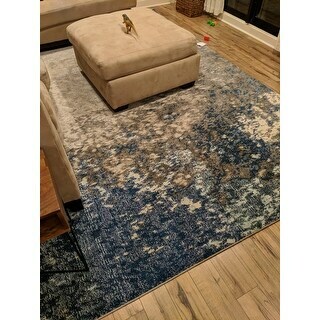 Option: Blue - 5' 3" x 7' 7"
I like the color and the feel of this rug. My floors and decor are mostly grey, so I wanted to add a little color. This does the trick! I had a very plush grey rug that was extremely hard to vacuum. I bought a robot vacuum and needed something much more low profile so it would not get stuck. I recommend this rug. Great rug, used it in my granddaughters room and it adds so much color! Perfect for our great room dining area. It’s low pile and synthetic, so less likely stain, but looks great! Also the design helps to hide stains. Delivery was quick and the rug was delivered into the house rolled up. It quickly flattened out. Nice rug for the price. The colors are vibrant and the quality is good. It is not a hugely thick nap, but should be good for the entry area we ordered it for. The colors are good, but wish the pinks and oranges were more prevalent. Overall, though, a great rug for the price. The quality is good. But I want more beige hues on the rug. Be careful if you are not sure about the color. It is hard to return these oversized items..
fits the room perfectly, and feels great! Looks exactly like on the photo. Very happy with purchase. Great value and lovely colors! Bought to blend with the colors of another rug and it works! 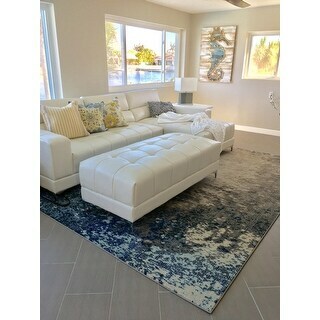 Beautiful and soft rug and the colors are gorgeous! It was a bit hard to unroll and get to lay flat but we put a couple of heavy boxes on each corner and it's flattening out nicely! We actually went and bought a 2nd one in the multi-color pattern! It's gorgeous and soft! I'd buy it again in a heartbeat. "How much does this rung weigh?" "Is this rug a loop or a pile?" The rug features a low pile for easy cleaning. I hope it helps. Because I'm hopeful! I hope it's going to work in my beach house with white leather sectional. The reviews are pretty consistently positive. I love that it congregates in one corner of the rug vs. being busy all over the place (like the other one I was considering, and hope I don't regret not getting instead). I chose the multi-colored rug because I love vibrant colors. "Is the color shades of Teal blues or Blue blues, is there any Taupe color in it?"